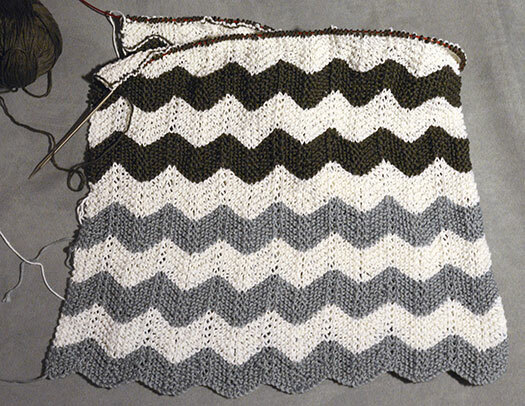 I finally picked up my long forgotten Waves of Grey shawl this past weekend, determined to finish it. 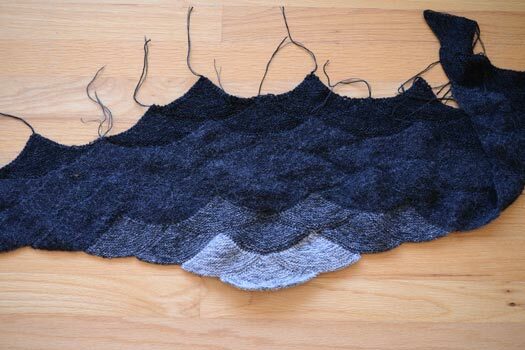 I wanted to work with my hands for the sheer fun of it (no gifts or a project for my store Tangled Loops) and the shawl WIP had been waiting patiently long enough. I got one little wave done before my toddler woke up from his nap. 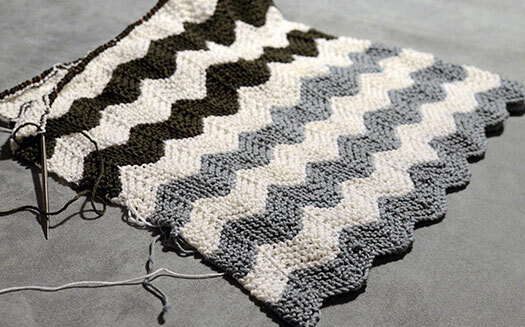 Not to be forestalled, I brought it into the playroom and started weaving in all the many ends in the back—if I wasn’t going to get anywhere knitting it, I could at least very well clean it up! Alarm bells immediately go off in my head and I walk him back to the playroom. I’m hoping he just snipped at the already cut ends I’d left on the couch and asked him if he’d cut into the shawl. No response. Evasive maneuvers. When I asked if he got the yarn from the already cut pile, he gives me an ambiguous yes and runs off. I look at my shawl and it looks to be ok, so I breathe a sigh of relief. 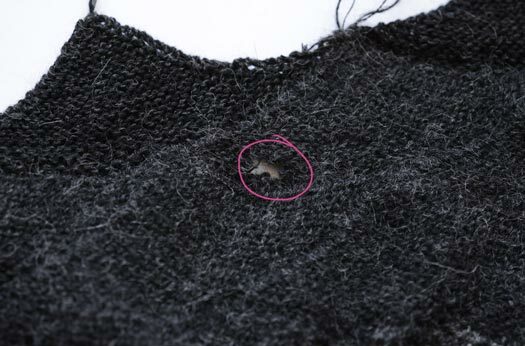 Until that evening, when I pick up my shawl to resume my work and I discover a hole. A very obvious snipped hole. And I start to laugh. Because all I could think of was his adorable pride in doing what mommy did and his vague guilt when he realized he might be in trouble. Besides, as my husband pointed out, I should never have left scissors around him (I definitely won’t here on out)! Silver lining: I can darn the hole and now when I wear the shawl, it will forever remind me of my little guy. My handiwork—second to last row! My crafting crew decided to do a weekend getaway for a craftcation in the woods. It was a weekend dedicated to girlfriends and crafts, good food and drink. 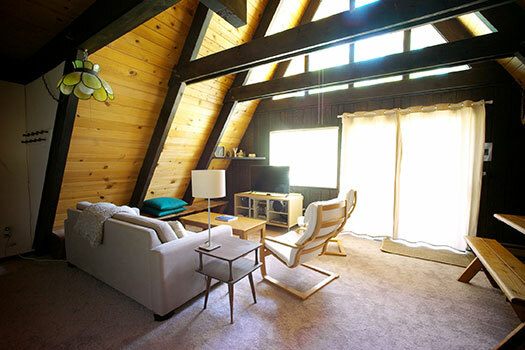 We holed up in a delightful cabin, tastefully decorated in hip, mid-century decor, with picture windows to the woods along the Russian River. For our food, we had each signed up to cook two meals or provide beverages and it worked out to be a gastronomic adventure, even with a variety of different dietary requirements amongst us (vegans, gluten-free, etc). One friend noted she hadn’t eaten so much delicious salad in her life. The range of options didn’t stop at food either. Everyone brought something different to focus on for the weekend—from weaving and decorative mending, painting and sketching (by hand and on the computer), sewing, hair-clip making to, of course, knitting! 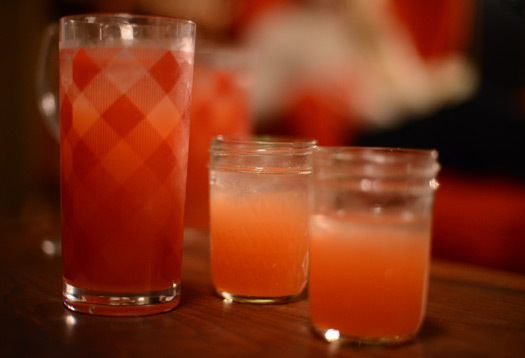 The weekend was a feast for all senses and I’m looking forward to the next craftcation, whenever that might be. Some friends and I rented a cabin in the woods along the Russian River in Northern California back in late February (another post to follow with more pics!). We were all getting together purely to hang out and craft the weekend away. My sister-in-law sent an adorable photo of the baby in the Baby Blues blanket months ago and I am just now posting the photo (alongside a photo of the finished blanket). The family went to the Monterey Bay Aquarium this weekend to keep little man D entertained and do a short road trip. I probably hadn’t been there in 10 years and, other than the sea otters and touch pools, had no idea what to expect. About two months back, my husband got a text message — our neighbor in Tahoe was kind enough to notice that some animal had ripped ALL the vents off of our cabin. A cabin which we’d neglected and apparently some animal(s?) had decided it was ripe for takeover. This was not the first animal break-in. 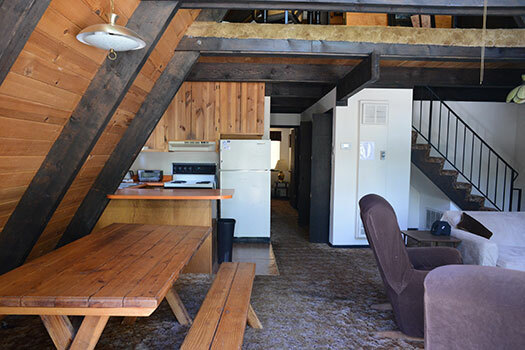 But it was the one which finally spurred us to take action—do we sell it or keep it to rent via AirBnB/VRBO? We crunched some numbers, discussed the options, talked to some realtors and decided we’d sell. It seemed like too much work to keep the house to rent—it needed lots of love. What the cabin looked like upon first entering. That’s the original carpet from the 70’s folks! View of front entry—notice the lovely half-working patio blinds and slipcovered lazy boy recliners. But on a gut level, I knew the cabin had a lot of potential. It was an A-frame after all! So, we decided we’d keep it (for the short-term), put some elbow grease into it and, working from a small budget, update the essentials. 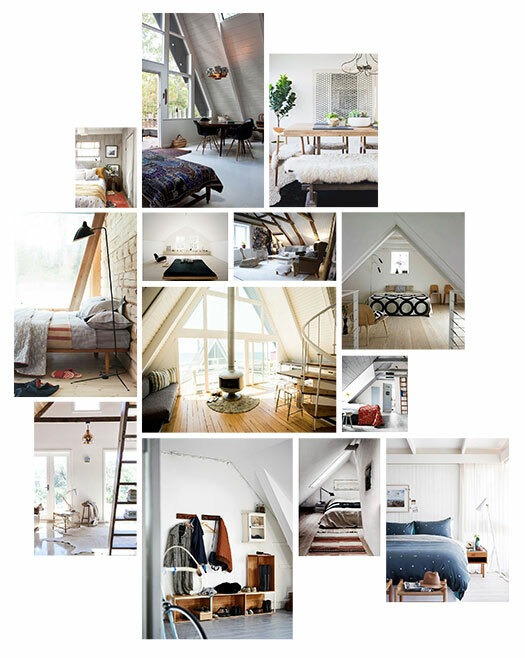 Gloriously simple, modern, Scandinavian-inspired WHITE interiors (see the full range of inspiration on my Pinterest board). Light, bright and inviting. I was already thinking about all the wonderful shades of white paint I could comb through to paint over the pine and the dark beams. Alas, the husband and I were in total disagreement. 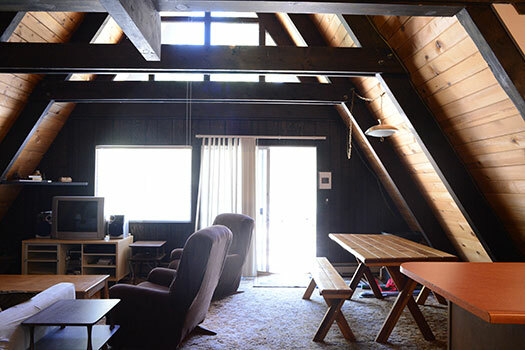 The budget backed him up and tipped the argument in favor of keeping the natural pine and dark beams (for now). Sigh. 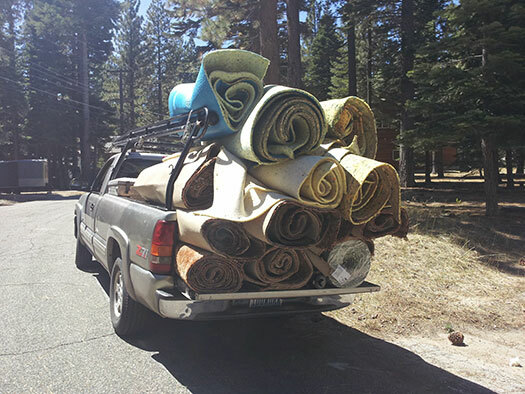 What we did wholeheartedly agree on was that the 30-40 year old carpet had to go. Here again we had an impasse as to what to replace it with: more carpet or vinyl planks that looked like wood (and was more durable to boot in some ways!). Again, the budget dictated the decision and we went with carpet (cheaper, warmer). It’s now in a state where we were able to post on AirBnB and even had our first renters over Labor Day weekend! It’s a work in progress and there’s still a lot to do, but the few changes we did make have already made it feel fresh. 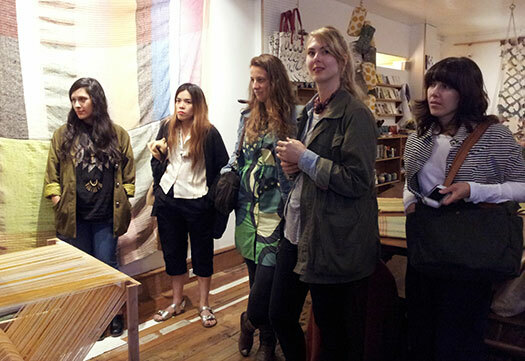 Our craft crew took an excursion into the Mission to watch a crafter in action. Specifically, a weaver. 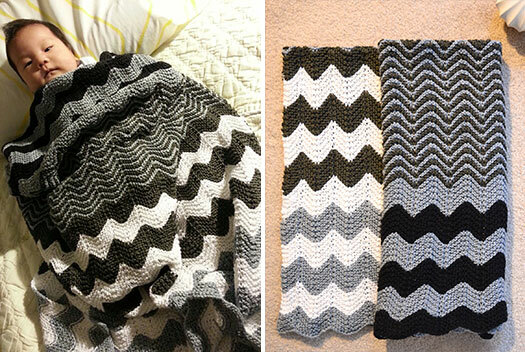 Of gorgeous blankets. 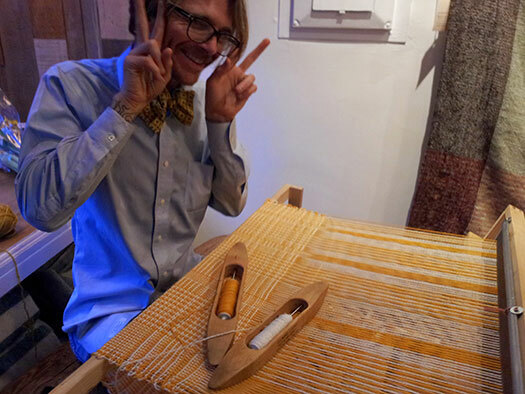 His name is Travis Melnolf and he constructed his own loom (you can find his plans here for free) and made himself available at Gravel & Gold (a tiny purveyor of crafted goods located in the Mission) on Thursday, July 17th, 2014. I was unprepared with anything but my smartphone so these photos below will have to do. 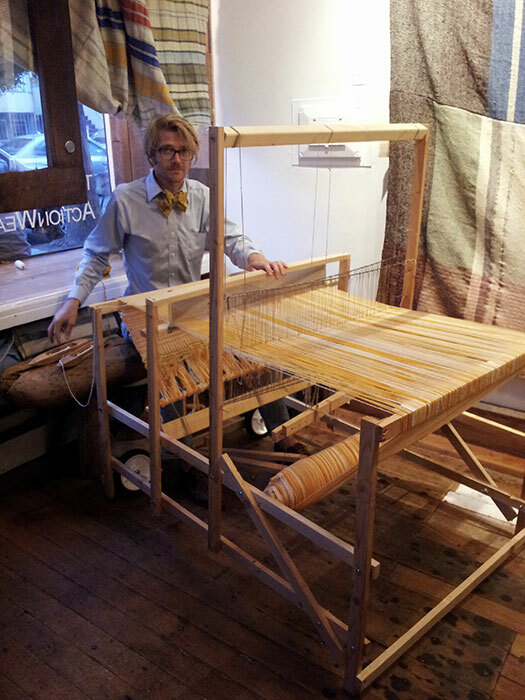 I’d never seen a loom in action so this was inspiring to watch. I was almost tempted to take up weaving. Almost. The trip instead inspired me to finally pick up my knitting needles again! But that story will have to wait for my next post. 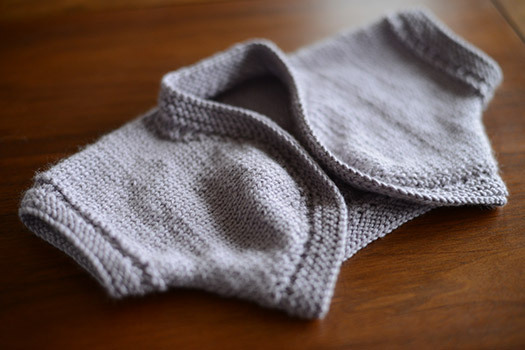 I am intrigued with the simplicity of knitting basic shapes and how they can be turned into gorgeous sweaters and cardigans when put together in interesting ways. 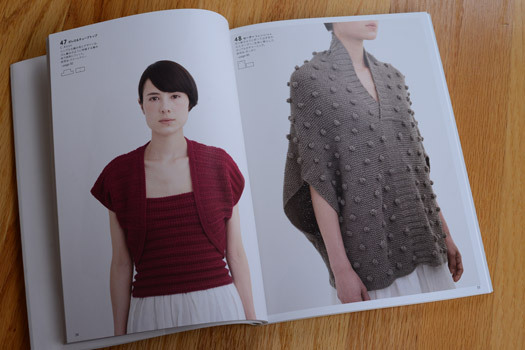 Brooklyn Tweed’s Inversion Cardigan is one example and the Pimlico Shrug from Knit 2 Together is another. Taking knit squares, rectangles or tubes (for the circle shape shown in the title), this book is chock full of interesting patterns for sweaters, shrugs, hats, mittens, slippers, and scarves. I can’t wait to decipher the charts and tackle one (or more!) of these projects soon!